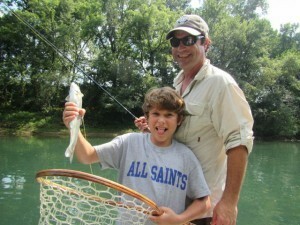 Patrick and his Dad, Blake, fished with us last spring in April and last Saturday they returned for another fly fishing trip on the Little Red River. For August it was really a cool morning with some pretty dense fog on the river and the fishing was pretty good. A #14 PBS and Born’s Hairy Legged Sowbugs produced quite a few nice Rainbows. We had a nice lunch on Bear Cave Shoal and afterwards we worked on Patrick’s roll casting and took a couple of fish swinging a #14 Goins Gold Soft Hackle. The afternoon got really warm and admittedly the fishing slowed down quite a bit. There was a small BWO hatch and the guys took a few Rainbows on #18 BWO Emerger. 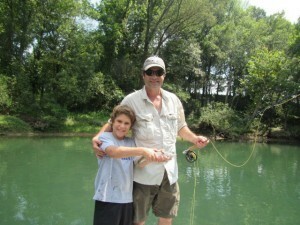 Patrick decided that he should take over role of fly fishing guide. He started just netting the fish that his Dad caught and did not let a single one get away. Then he decided it might be a good idea to learn how to row the boat so Bo let him get on the oars. Patrick spent about a half an hour working on keeping the jet boat moving at the same speed as his Dad’s drifting fly. 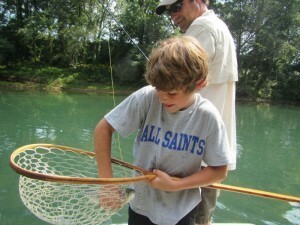 As soon as his Dad would hook up Patrick would be up grabbing the net and releasing another Rainbow. As they say, it is not all about catching fish and this day was all about a father and his son enjoying a day together on the river!